Second World War memoirs from British servicewomen are comparatively rare. Memoirs of teens who volunteered for service are even harder to come by. Her Finest Hour is a valuable contribution to making up that deficiency. Dramatic, humorous, romantic, tragic and simply bizarre episodes tumble off the pages. Bombed out of her family home (twice! ), Marjorie “Terry” Smith was a nurse’s aide during the Battle of Britain and joined the WAAF at seventeen. She served in the operations rooms at several RAF airfields around England right through the War. Among other incredible experiences - meeting legendary fighter pilots like Douglas Bader - her startling confrontation with Winston Churchill is a real gem. 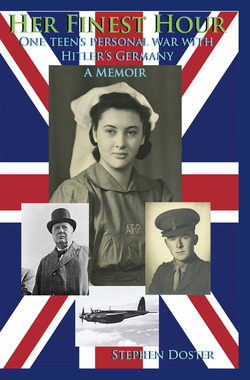 This book, told unvarnished in the first person, is a must for anyone wishing to get a woman’s perspective on WWII and a rare testimony from the “lower ranks” of the British armed forces. She and her contemporaries were just teens, but what extraordinary men and women they would become. This is their story told through the lens of one person. For Terry Smith, this was her finest hour. See Brunswick News article!